The NFPF features in two events at this year's edition. 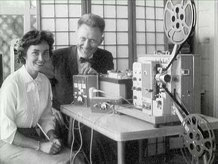 On Friday there will be a panel on "Recovering Early Optical Sound: Joseph Tykociner’s 1922 Composite Sound-on-Film System." This footage of early sound-on-film demonstrations was produced in 1922 by the first Research Professor of Engineering at the University of Illinois at Urbana—Champaign. It was preserved by the University through an NFPF grant. On Saturday the Reel Thing will give “A 20th Anniversary Salute to the National Film Preservation Foundation,” featuring a wide-ranging set of clips from films preserved through our grant programs. Speaking of grants, several recipients of our 2017 awards have been in the news and earned their share of media attention. Moving Image Preservation News has provided in-depth articles, including interviews with archivists, on two soon-to-be-preserved films: Code Blue, a 1972 recruitment film aimed at bringing minorities into the medical profession, to be preserved by Washington University, and Decision for Happiness (1958), a sponsored film about a young woman’s decision to join the Sisters of St. Agnes convent in Fond du Lac, Wisconsin. The preservation will be overseen by the Congregation of Sisters of St. Agnes. Bowdoin College meanwhile gives the behind-the-scenes story of The Heath Hen (ca.1932). This rare footage of the last surviving Heath Hen, nicknamed Booming Ben, was filmed by Bowdoin biology professor Alfred Otto Gross and rediscovered in his daughter’s attic by his grandson Edward Minot, interim director of the Bowdoin Scientific Station on Kent Island. In the last featured article, New York University discusses two grant projects developed by students in its Moving Image Archiving and Preservation Program: Laserimage (1971–72), Ivan Dryer’s celluloid forerunner to the Laserium light show, and—in partnership with the Flaherty— Troublemakers (1966), Norman Fruchter and Robert Machover’s documentary about community organizing in the Central Ward neighborhood of Newark, New Jersey.